One of only a handful of condos available at the lake, this one is likely the best. Located with 4 neighboring condos just above the Arenal Country Club, this condo has been beautifully upgraded with new cabinetry, new appliances, new furniture, and, most enticing of all, a second-floor deck overlooking San Luis Cove and the lake. 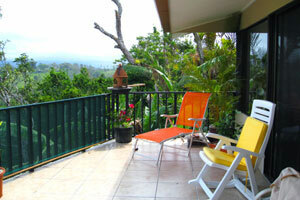 Located beside the paved Tronadora road, the condo is within 10 minutes of Tilaran, Costa Rica's nicest town. 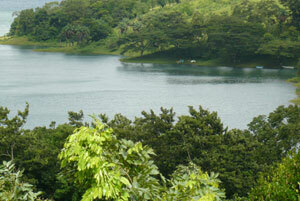 Just over an hour from the international airport at Liberia, it's convenient for those wanting a vacation home. Adding to the vacation amenities are the club facilities, which include a huge swimming pool and two tennis courts, available with just a small daily or monthly fee. 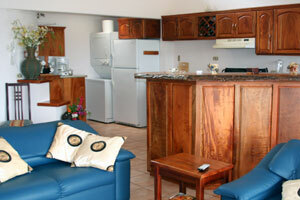 Each of these condos, originally built about 2000 as part of the club facilities, are individually owned and maintained. 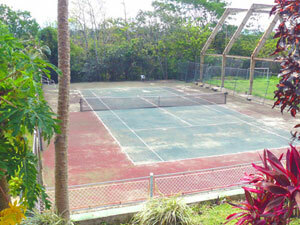 There is no condo association, but they are securely located within the formidable fencing of the country club. The condo has its own automatic electric gate to the condo and its parking area. Also available at a great low price - $5,000 - is a fully loaded, well maintained 2000 GMC 4WD SUV with a 4300cc gas engine. This furnished condo in its beautiful temperate location is a wonderful opportunity to combine paradise with convenience and economy. On Google Earth, see the location of this condo at 10° 30' 18.94N and 84° 55' 53.74W. A sunset, seen from the condo deck, colors the lake and terrain. 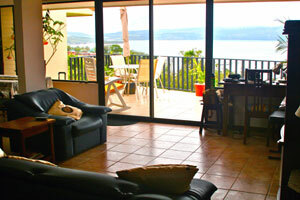 The open, high-ceilinged interior has a great view of cove, lake, forest, and mountain. 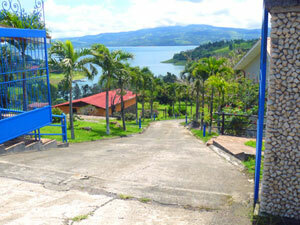 San Luis Cove, where there is a small marina, is less than 300 yards below the condo. 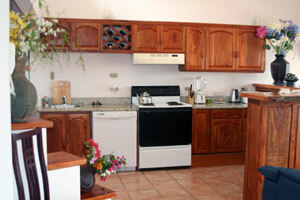 The kitchen has excellent custom cabinetry, an array of new appliances, and the great lake view. The condo is at the far end of the five two-story homes, the only one with a deck. 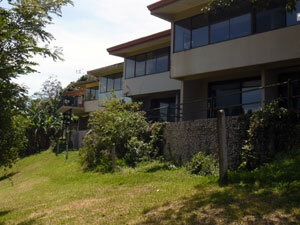 Beside the condos is the drive to the Arenal Country Club's facilities. 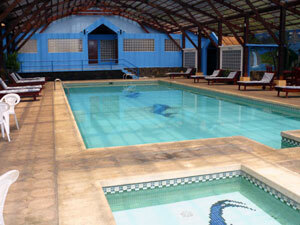 The pool with dressing rooms and more. 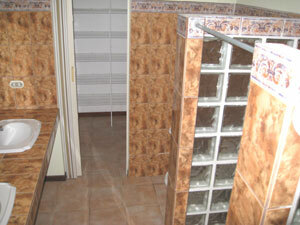 The master bedroom and large bathroom are on the bottom level. Large windows enable great lake views, even from the bathtub. 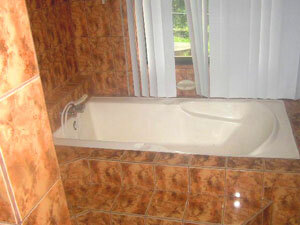 A second bedroom and bath are on the level. The third bedroom and bathroom are on the upper level along with the kitchen, living room, and deck. 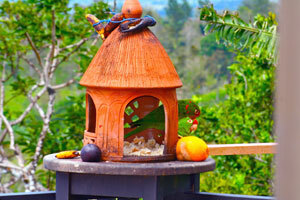 A wild parrot visits the feeder located on a corner of the roomy deck.